In the past, the dominant way to provide additional functionality to Microsoft Dynamics NAV was the development of add-on software solutions. With the release of the role-tailored client, Microsoft created the opportunity for ISVs to also develop fully integrated .NET add-ins. So, if you're looking for a way to add functionality to your Microsoft Dynamics NAV system, you should be aware of the subtle but important difference between add-ons and add-ins. Add-ons send data to third-party systems, which can leave your system completely vulnerable. You could be sending client data and confidential business data to a third party software that is not properly secured and have absolutely no way of knowing. Add-ins remain entirely within Microsoft Dynamics NAV and hence within your control, with your data remaining on your own secured network. This is incredibly important if you have data that you need to protect. Typically, add-ons are entirely new and external enhancements to an existing software product. They come with their own branding, user interface, and menu structure. As such, they provide a completely different user experience compared to Dynamics NAV. Many users may have difficulty adapting to an add-on for this reason. Training a user to use an add-on is very similar to training them to use an entirely different software system altogether. Add-ins, by contrast, work directly within the system. In that regard, anyone already familiar with Microsoft Dynamics NAV will be able to pick up a standard NAV Gantt chart add-in and begin working with it practically immediately. 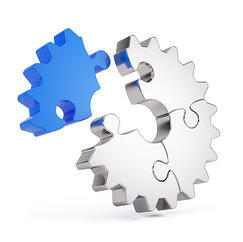 Add-ins are a comprehensive and seamless solution that offers an incredible amount of benefits. An add-in is basically increased functionality within a system while an add-on is something that is patched over the system. Patching something over a system can create system incompatibilities, confusion and general disarray. A properly built add-in - like the Visual Production Scheduler - is a sleek and streamlined product that many would be unable to tell did not come with the original software system. It feels like a natural puzzle piece of the entire Dynamics NAV system. Add-ins require less technical support because they are directly integrated into the system. The Gantt add-in functions exactly like Microsoft Dynamics NAV native functions and thus is extremely stable. With add-ons, you have to worry about the third-party systems, the integration, the interfaces and everything that can go wrong between the add-on and the Microsoft Dynamics NAV system. Typically, an add-in allows for a fast and easy deployment: For example, the installation of the Visual Production Scheduler takes only a few clicks. This installation requires no adjustments, which makes it a rapid-fire solution that can be up and running for the benefit of your customers in a matter of an hour. As it is seamlessly integrated into the system and as it based on the vanilla Dynamics NAV standard, the NAV Gantt add-in is much easier to deploy than an add-on would be. State-of-the-art .NET add-ins are available on all current Microsoft Dynamics NAV role-tailored versions including Microsoft Dynamics NAV 2013 R2. Add-ins integrate into Dynamics NAV and hence do not require any kind of "overhead code" such as menu bars, backend databases, integration and synchronization. They typically come with much leaner code. Hence, add-ins can get enhanced and can grow in a much more agile way. For example, the Visual Production Scheduler had been released in March 2013 and we have been able to provide releases with major functional enhancements every 3-4 months since then. As an add-in, we have the opportunity to let our product quickly grow with customers' and partners' needs. If you are interested in extending your installation of Microsoft Dynamics NAV with Gantt chart functionality, we recommend having a look at the Visual Production Scheduler. Add-ins are more secure, easier to use and easier to deploy than add-ons, and there are extensive add-in options for those that would like to customize Microsoft Dynamics NAV for their company's unique enterprise resource planning needs. btw: if your are Dynamics 365 Business Central or NAV ISV and want to enhance your ISV solution with a visual scheduler, we have created an extensive page. Here, we cover (nearly) everything you need to know when developing a Gantt chart scheduler for Microsoft Dynamics 365 Business Central and Dynamics NAV.